Corporations began targeting their marketing messages directly to children during the 1980s, as affluent adult markets became saturated with consumer goods. Large firms established ‘kids’ departments and smaller firms specialised in marketing to children. A number of advertising industry publications were created such as Selling to Kids and Marketing to Kids Report. The academic literature began to feature studies of children as consumers. The international children’s market is increasingly attractive to transnational corporations who seek to make their brands and products popular in different cultural milieus. The food industry was a pioneer in these efforts. In 1997 Brandweek magazine noted that McDonald’s was the favourite fast food all over the world and Coca-Cola the favourite drink. Not only are there many more advertisements aimed at children but they are increasingly infiltrating the private and public spaces where children play and learn. Today’s children are confronted with advertisements almost everywhere they go. There are now television stations, radio stations, newspapers and magazines delivering underage audiences to advertisers 24 hours a day. As the amount of money being spent increased, the age that children were targeted decreased. A marketing conference in 2000 in New York was entitled “Play-Time, Snack-Time, Tot-Time: Targeting Pre-Schoolers and their Parents”. There is even a US cable station, BabyFirstTV, which aims at under-two year-olds. Television is an ideal way for advertisers to reach children as it is so omnipresent in homes around the world. In more than a third of the homes of American preschool children the television is on most of the time, whether or not anyone is watching. By the time they get to first grade American children will have “spent the equivalent of three school years in the tutelage of the family television set” and by the time they finish high school they will have spent more time watching television than they spent in class for their entire schooling. Individual commercials are repeatedly shown for months and “effectively penetrate” the language and thinking of young children. They repeat advertising jingles and slogans to friends, draw advertising images and logos in their artwork, and discuss advertisements with their friends. Roy Fox, in his book Harvesting Minds, pointed out: “A person’s image and language create his or her sense of selfhood. And this selfhood – especially during our formative years – is the most valuable, fragile quality we’ll ever embrace.” Yet it is sold as a commodity over and over. Today it is advertising jingles that children sing rather than nursery rhymes. Advertisements appear on banners at the top of websites, on scroll down frames at the side of the windows, and unbidden on pop-up windows. There are even animated product “spokescharacters” to interact with the children and develop relationships with them so that they can be persuaded to buy something. Internet advertising is particularly effective at targeting children because they are less able to tell the difference between advertisements and other content. They are more likely, for example, to click on banner ads thinking they are part of the website, offering information or entertainment, and they tend not to take any notice of annotations like “AD” or “PAID” that are supposed to indicate advertisements. The meagre regulations that television advertising is subject to don’t apply to the internet. Advertisers and marketers are free to merge content with advertising and exploit children with few if any limits. The ads on internet sites are often integrated with the other content of the internet site – games and competitions, music downloads, video clips, discount coupons, online chat rooms, free email, club membership, gossip, fashion tips or advice – which is designed to keep the children engrossed in play for hours at a time and to keep them coming back. Marketers and advertisers are “fundamentally reshaping the digital culture, creating new hybrid forms that blend communications, content and commerce”. For example the Family Education Network, a division of Pearson Education, runs FunBrain.com and FEkids.com websites for children with “the hottest collections of games and activities” on the internet. It offers advertisers access to “over 7.5 million unique kids targeted by age and gender”, three quarters of whom are between 6 and 12 years old. Three quarters of food manufacturers advertising on the internet have designed websites specifically for children, some for very young children; many others have websites that have a children’s section. The address of the website is often given on the product packaging. Most of these websites are plastered with brand logos and advertising claims and include links to other food related sites. On some websites children are encouraged to view television advertisements for the product. On others they are offered branded downloads such as music clips, mobile phone ringtone, desktop wallpaper, screensavers. Between ages two and five most children cannot even differentiate what happens on television from reality. They are very interested in commercials, which they believe without reservation. Marketing consultant, Dan Acuff, notes that until the age of seven children tend to accept television advertising at face value and he advises advertisers how to take advantage of that. For example he tells them that at this age kids are particularly susceptible to give-aways and similar promotions because “the critical/logical/rational mind is not yet full developed”. Studies commissioned by the US Surgeon General have demonstrated the failure of children under eight to understand persuasive intent. Even if they can differentiate advertisements from television programmes, (and sometimes the boundaries are blurred so that even adults don’t recognise some content as advertising), about half of them still don’t understand that the advertisements are trying to sell them something. The problem with not understanding persuasive intent is that children will therefore tend to trust what the advertisement is telling them and not recognise its bias nor that it may “exaggerate, manipulate, pontificate, and cajole” in order to get them to buy their product. The use of celebrities to exploit a child’s trust in authority figures. Free gifts are a particularly effective way of attracting child customers. Free toys can double or triple the sales of McDonald’s meals to children. One of the most successful was the Teenie Beanie Baby which was thought to have sold 100 million Happy Meals in ten days compared with normal sales of ten million per week. Fast food and cereal marketers often take advantage of children’s natural inclination to collect things by offering gifts in sets as collectors items. For example, when McDonalds gave toy Hummers with its happy meals as part of its “Hummer of a Summer promotion” there were 8 different Hummers to collect. When Frito-Lay offered small collector discs called Tazos free in its Doritos chip packets in 1996 it had to increase production by 40 per cent to keep up with demand. Advertisers not only promote unhealthy foods but they create a culture where food is eaten for pleasure or fun without any need for discretion, limits or care. Often manufacturers use food additives such as colouring solely for the purpose of making it appealing and eye-catching to children. The UK Food Commission found that 75 per cent of food that contains high amounts of added fat, sugar and salt also contains ‘cosmetic additives’. These additives, including artificial colour, have been shown to increase hyperactivity in children. The food and beverage industries have denied the link between their products and weight gain in children and funded several studies to support this denial (see box below). A Yale University survey of 88 studies found that “Studies funded by the food industry simply did not find the degree of negative health effects from soft drinks that independent scholars discovered. Coca-Cola was the sole sponsor of an Australian government study into children’s exercise habits. The ensuing report in 2004 claimed that it was declining physical activity that was the major cause of rising childhood obesity. Cadbury Schweppes donated millions of dollars to the American Diabetes Association, and shortly afterwards the Association’s chief medical officer denied the link between sugar and diabetes as well as between sugar and weight gain. In Australia McDonalds is paying the National Heart Foundation $330,000 per year in return for the Foundation’s tick of approval for nine of its meals. The foundation says the money is to reimburse its costs in testing the meals and auditing McDonalds restaurants. In 2002 a draft report of the Joint WHO/FAO Expert Consultation on Diet, Nutrition and the Prevention of Chronic Diseases called for stricter marketing rules and labelling, as well as taxes on sugar-rich food marketed to children. It prompted the American Advertising Federation, the American Association of Advertising Agencies, the Grocery Manufacturers of America, the National Soft Drink Association, the Snack Food Association, the National Confectioners Association, the US Chamber of Commerce and several other industry associations to write to the US secretary of Health and Human Services to “express our concerns” that the report would harm the US food industry. The industry letter argued the report “should be substantially modified before being issued by WHO and FAO”. The following year the Sugar Association “threatened lobbying to block WHO funding if the report was not changed.” At the behest of industry lobbyists the Bush administration opposed WHO anti-obesity initiatives behind the scenes and objected to the way the WHO identified some foods as “bad”. Coca Cola’s Beverage Institute for Health and Wellness emphasises the importance of drinking enough fluids so as not to become dehydrated and argues that any drink suits this purpose so “there’s no need to stick to plain water if it bores you”. The food industry also argues that achieving a balanced diet is a parental responsibility and that government regulation of junk food advertising represents the intrusion of a “nanny state” into private lives. Advertisers nevertheless seek to market direct to children, bypassing parental gatekeepers where they can, encouraging pester power to overcome parental resistance. Moreover, the UK Office of Communications (Ofcom) found that mothers “are at a loss” as to how to make a healthy diet attractive to children in the face of the barrage of marketing making junk food attractive to them. In 2007, when the food industry was under threat of advertising regulation in the US, a group of major food companies including McDonald’s and PepsiCo agreed to voluntarily stop advertising the worst of their foods during children’s television programmes. They will not however, stop advertising these same foods during family programmes such as the enormously popular American Idol, which most children watch. Similar promises were made by Kraft in 2005 and Kellogg’s in 2007. Advertisers also like to claim that exposing children to advertising is part of their education and enables them learn to deal with advertisements and learn critical skills. However, the evidence seems to be that those “who watch most television tend to be the most easily influenced by a given advertisement” and, in particular, younger children do not become more sceptical of advertisements, the more they see. Heavy television watchers tend to ask for the products advertised more often. Critical skills are not gained by watching more advertisements. 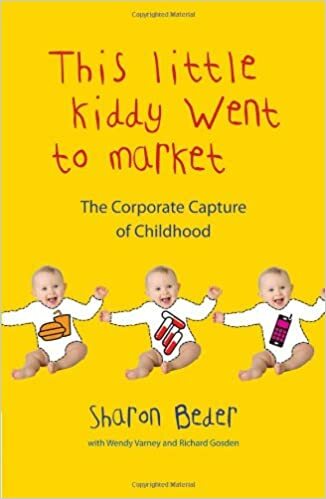 The above is an extract from ‘This Little Kiddy Went To Market – The Corporate Capture Of Childhood.’ (Pluto Press, 2009) by political analyst and visiting professor at the University of Wollongong, Australia, Sharon Beder. It’s making kids slaves to the corporations. Should be read in conjunction with Smedley Butler’s ‘War Is A Racket’.I’ll post a youtube clip in a few minutes. I appreciate you taking time to read this blog. Thank you.